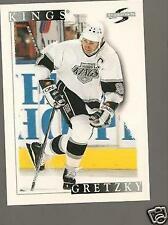 Player: Wayne Gretzky. Set: 1996-97 Zenith Artist's Proofs. Year: 1996. OR MORE IN THE CONTINENTAL USA ONLY! WE HAVE BEEN SERVING THE SPORTS CARD INDUSTRY FOR OVER 31 YEARS NOW, GIVE US A TRY! Item Condition: Near Mint/Mint. Player: Wayne Gretzky. Set: 1997-98 Pinnacle Certified. Team: New York Rangers. Year: 1997. Card#: 100. 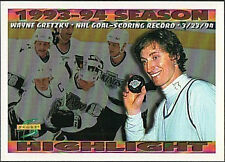 1990 Score Wayne Gretzky. Great color. 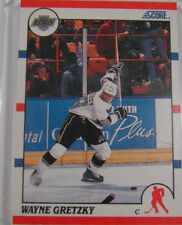 1990 Score Hockey Promo Wayne Gretzky - #1 "Catches Left"
1990 Score Hockey Promo Wayne Gretzky - #1 "Catches Left". Condition is Like New. Shipped with Economy Shipping. Invoices with more than 10 cards will be split evenly. There are no creases, sharp corners. See all pictures.